Land planarians (=terrestrial flatworms) are the large group of the Tricladida (Plathelminthes, "Turbellaria", Seriata, Tricladida, Terricola); the other 2 groups are Maricola (marine triclad planarians) and Paludicola (freshwater triclad planarians). The group of the Terricola consists of 3 families (and 5 subfamilies), 45 genera (and 2 subgenera), and some 810 species (and some 20 subspecies) (cf. Ogren, Kawakatsu and Froehlich, 1997). Among these families, the Bipaliidae has 3 genera and approximately 160 species (and 14 subspecies) or more (cf. Kawakatsu, Ogren and Froehlich, 1998; Ogren, Kawakatsu and Froehlich, 1997, 1998; Ogren and Sluys, 1998, 2001). The outline of the taxonomic system of the Terricola (families and subfamilies) will be shown in the last section of this web article. The Bipaliidae is essentially a Southeast Asian family; the species inhabit moist forests, leaf molds and residental gardens of human habitation. Several species have a worldwide geographical distribution which is the result of accidental and intentional distribution of soil and plants by human activities following the late 16th or early 17th Century. This expansion of domains in some bipaliid species appears to have accelerated in the 20th Century --- especially after the World War II. During the rainy season in Central and Southern Japan, several bipaliid species are regularly observed in gardens and wet places of the countryside, especially June to early July. In Southern Japan, planarians can be found in the mold layer even in cold weather. Because of their rather large body size, 3-10 cm or more in length, and noticeably fan-shaped head, the bipaliids are conspicuous soil animals, sharing the habitat with earthworms, centipeds, millipeds, snails, and slugs. We have found some old records of bipaliid animals in Japanese Materia Medica written as manuscripts and/or published as woodblock books in the prescientific age [under the national isolation]* (from the beginning of the 17C to the middle of the 19C). It is very clear that those natural history records of bipaliid animals in Japan undoubtedly originated from the Chinese Materia Medica (cf. Kawakatsu, 1969, 1991; Kawakatsu and Lue, 1984; Kawakatsu, Tamura and Lue, 1984; Lue and Kawakatsu, 1986). Very recently, Dr. Kawakatsu and his coresearchers published an English article on the places of origin of 3, very large Bipalium species from Japan: B. nobile Kawakatsu et Makino, 1982; B. kewense Moseley, 1878; B.? multilineatum Makino et Shirasawa, 1983** (cf. Kawakatsu, Ogren, Froehlich and Murayama, 2001). * This was the period when Japan had very little contact with other parts of the world. ** The third species is tentatively cited as Bipalium? multilineatum. See Note in the ‘Taxonomy of the land planarians (families and subfamilies)’ in the present web article. In their bibliographic work (Kawakatsu, Ogren, Froehlich and Murayama, 2001), an authentic record of a Chinese bipaliid animal was recognized in the ms. of Materia Medica written in C.E. 860 entitled “Yu-Yang Tsa-Tsu” (by C.-S. Tu'an). Since the above-mentioned paper was submitted for publication, another old Chinese manuscript (produced in C.E. 739) has been found by Sasaki, which contains a note on bipaliid animal. According to Dr. Kawakatsu's kind advice and encouragement, Sasaki's web article on this topic in Japanese was prepared: http://www2u.biglobe.ne.jp/~gen-yu/kougai.html. And, the present new web article is essentially an English version of the Japanese version cited above. However, this English version is prepared in a more academic style than that of the Japanese version. Note. Some marks for accents and pronunciation in Romanized Chinese characters cannot be shown in this web article. Shen-num P'en-Ts'ao Ching (ms., 3 vols.) is known as the oldest Chinese Materia Medica compiled by Tao, H.-C. (C.E. 452-536) in the beginning of the 6th Century (ca. C.E. 500). He collected and compiled considerable popular herbal knowledge present among the people at that time. He also compiled another Materia Medica including his many notes in nearly the same age: Chi-Chu P'en-Ts'ao (7 vols.). Hsin-Hsiu P'en-Ts'ao (ms., 20 vols.) was completed by Su, C. in C.E. 657 in the T'ang Dynasty (C.E. 618-910). The basal knowledge or data for this herbal and natural historic works was undoubtedly based upon Tao's ms. completed some 150 years earlier (see above). We have found the following Chinese sentences in Su's ms.
English translation. “ There is a very long and slender worm with a yellowish coloration. Externally, it looks like a centipede. Its name is ‘T'u-chong’ (i.e., a soil worm). Chickens that peck the worm groan and die soon ”. Additionally, the item “Shui-chia” (i.e., water leech) is found in those old Chinese Materia Medica. 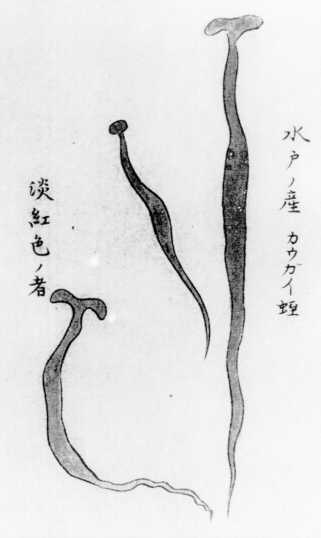 According to Dr. Kawakatsu's opinion, some reports in these old Chinese manuscripts refer to ‘leech’ which may correspond to what we today call a freshwater planarian. (cf. Kawakatsu, 1969; Kawakatsu and Lue, 1984; Kawakatsu, Tamura and Lue, 1984). Note. Classical Chinese sentences should be read from the top to bottom in each longitudinal line of letters and from the right to left of longitudinal lines. The left-side photo shows the section of “Ma-liu” found in Cheng-Lei P'en-Ts'ao published by T'ang-Wei (ca. 1100). The photo was taken from the lithographic reproduction book (vol. 21, p. 437; 1957, Beijing) of Cheng-Lei P'en-Ts'ao published by T'ang, Shen-Wei (ca. 1100). The two lineages are known of T'ang's (ca. 1100) Materia Medica mentioned above. One is the Chéng-hu routes and another, the Ta-kuan routes. It is known that some characters used are different in each lineage. The photo shown here (see above) belongs to the Cheng-hu routes. Making a comparison between Su's (C.E. 657) “Ma-liu” (or “Tu-chong”) and Chen's (C.E. 739) “Ma-liu” described in old Materia Medicas, we consider that the former may be a many-legged Arthropod (Class Myriapoda: centipeds or millipeds). On the other hand, Chen's “Ma-liu” has no legs, worm-like, and is very different from the Arthropods. Tao's (ca. C.E. 500) oldest description of “Ma-liu” seems to be most similar to Su's (C.E. 657) worm-like animal. As was already shown in the English translation, Ch'en's (C.E. 739) description of “Tu-chong” includes very clear morphological characters: 1) A middle-sized worm having a slender and elongated body form with a shovel, fan-shaped, or semilunar head and without legs; 2) having yellowish and blackish longitudinal stripes on the dorsal side of the body. Moreover, the white creeping-prints of worm were observed. Judging from the external characters and living appearance mentioned above, Ch'en's (C.E. 739) “Tu-chong” appears to be the oldest record of a species of bipaliid worms in China. It must be noticed that there is confusion of the names of “Ma-liu” and “Tu-chong” used in various versions of Chinese Materia Medica compiled and printed after the middle of the 8th Century. 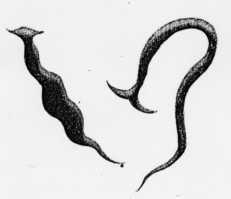 Planarian papers published in the 18-19th Centuries in Europe. Yu-Yang Tsa-Tu (ms.) was completed around C.E. 860 by Tu'an, C.-S., the literary man living in the mid-eastern China in the T'ang Dynasty. He wrote a note on “T'u-K'u” or “To-K'u”. (‘Doko’ in Japanese pronunciation). Its verbatim English translation cited from Lue and Kawakatsu (1986: 318) is as follows. The contents of Tu'an's (860) ms. cited above is undoubtedly based upon Ch'en's (739) ms. in the principal part. However, the former includes Tu'an's observation about the feeding behavior and fragmentation (asexual reproduction!) of the worm. Kawakatsu and Lue (1986: 318) pointed out that this Chinese animal appears to be a large species of land planarian belonging to the genus Bipalium; those authors considered that “ ... this is the oldest record of planarians in the world.... ” (see also Kawakatsu, Ogren, Froehlich and Murayama, 2001: 43). According to the latest bibliographic data mentioned in the foregoing section of this web article, it became clear that Ch'en's (739) ms. is the oldest record of land planarians (Bipalium? species). P'en-Ts'ao Kang-Mu (wood-block book) was published from 1590 to 1596 in the Ming Dynasty by Li, S.-C. (1518-1593) and his son. This bulky book (52 vols.) of Materia Medica includes 1892 entries on various plants, animals, minerals, and natural phenomena. Almost all articles found in previous Materia Medicas are reproduced under each item of Li's book with his detailed notes or comments. For this reason, Li's book serves as an Encyclopedia of the Natural History of that age in China (the late 16C.). It is, however, noted that Li's book may include incorrect information. In Li's book, the item “T'u-K'u” or “To-K'u” is not found. However, in the item of “Ma-liu”, previous descriptions found in many old Materia Medicas were reproduced with his detailed comments. According to Li's opinion, Ch'en's (739) “Tu-chong” and Tu'an's (860) “T'u-K'u” (= “To-K'u”) are the same animal; it is different from Tao's (ca. 500) and Su's (657) “Ma-liu” and “T'u-chong”. This seems to be valid opinion from our current biological perspective. Volume 40 of Li's book contains descriptions of several species of water-leech, mud-leech, grass-leech, stone-leech, and mountain leech. There are some possibilities that some of these animals are bipaliid land planarian species (cf. Kawakatsu and Lue, 1984; Kawakatsu, Tamura and Lue, 1984; Kawakatsu, Ogren, Froehlich and Murayama, 2001; Lue and Kawakatsu, 1986). Photos and figures of Li's book are found in some of papers cited above. Note. Concerning the first record of bipaliid land planarian species in old Chinese Materia Medica, Dr. Kawakatsu has prepared an English leaflet including reproductions of some parts of “T'u-chong” and “T'u-K'u” taken from his collection of literature. Since it is not a formal publication, copies will be distributed to turbellariologists with a reprint of the paper by Kawakatsu, Ogren, Froehlich and Murayama (2001). In a recent paper by Kawakatsu, Ogren, Froehlich and Murayama (2001), they considered the places of origin of 3, very large bipaliid land planarians from Japan. Their conclusions are: 1) Bipalium nobile (300-800 mm or more long and 5-10 mm wide) is considered to be native in (mid-central and southern?) China; 2) Bipalium kewense (60-350mm long and 3-5 mm wide), a cosmopolitan species, has the natural range in Southeast Asia; 3) Bipalium? multilineatum (60-300 mm long and 5-7 mm wide) may have originated in Japan (as an old invading species) and is considered a native to Central Japan. Kawakatsu et al. (op. cit.) have realized by examining old Materia Medica records and recent sketch figures of 2 Chinese bipaliid species by Sum and Wu (1998), that the so-called “T'u-chong” and “T'u-K'u” (“To-K'u”) worms may actually represent the 2 bipaliid species, i.e., B. nobile and B. kewense. Note. Dr. Ogren has the following question: "I think there is a problem here. I do not see how a non-sexual species could arise in Japan without any other species of Bipalium around. It is more likely that the species B. multilineatum is of recent origin from one of the invading species" (in litt. to Dr. Kawakatsu, Sept. 20, 2001). This is an open question. Separation of the Old Japanese Islands from the northern edge of the Asiatic Continent began in the Miocene Epoch (ca. 20 M. Y. ago; Tertiary Period: Neozoic Era). See the following papers. Kawakatsu, M., Oki, I., Tamura, S., Ogren, R. E., Yamada, T. & Murayama, H., 1990. Preprint of papers given at the Sixth International Symposium on the Turbellaria, Hirosaki, August 7-12, 1990. Occ. Publ., Biol. Lab. Fuji Women's College, Sapporo (Hokkaidô), Japan, (22): 1-16. This article includes 8 palaeographical maps of the Far East (figs. 22-29 on pp. 13-16). Tamura, S., Oki, I. & Kawakatsu, M., 1991. Karyological and taxonomic studies of Dugesia japonica from the Southwest Islands of Japan-II. Hydrobiologia, 227: 157-162. The geological history of the Southwest Islands of Japan is described in detail (on p. 161). 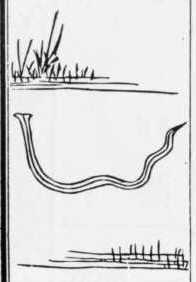 A description of the “T'en-Shé” is found in Li's book of Materia Medica (vol. 43). 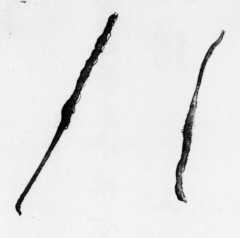 Reed (1934: 348) expressed his opinion that the ‘animal’ may be a Bipalium? sp. His opinion, with an English translation of Li's Chinese item, was included in a paper by Kawakatsu, Ogren, Froehlich and Murayama (2001: 44, fig. 2, bottom-left) (see also Lue and Kawakatsu, 1986: 318). Reed's (op. cit.) conclusion remains to be confirmed. Some researchers supposed that “T'ien-She” may be a species of snake (Calliophis macclellandi Reinhardt). Wakan Sansai-Zue (wood-block book) was published in 1713 by Ryôan Terajima (?-? ), a herb doctor living in Ôsaka, Central Japan. The Japanese name of book means ‘An Illustrated Encyclopedia of the Chinese and Japanese Natural History’ (105 vols., 81 copies). It is known as the oldest encyclopedia compiled and published by the Japanese naturalist. It is believed that Nakamura's “Kinmô-Zui” (1666) was a model of Terajima's 1713 book. Wakan Sansai-Zue (1713). Right: The cover of Vol. 52 (a group of worms hatched from eggs); left; a page showing “Doko” (=Bipalium? sp., a photo enlargement is available) and “Geji geji” (=house-centipede). Dr. Kawakatsu's copy reproduced here was taken from the original book of the late Mr. Matsui's collection. 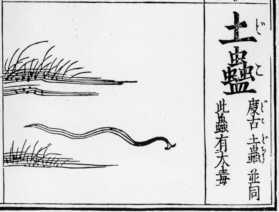 The following literal translation in English of Terajima's (1713) descriptions and notes on land planarian(s) (4 longitudinal lines of Chinese characters shown in the fig. ; an enlarged photo of this part is available) is cited from Lue and Kawakatsu (1986: 319, left column). Lue and Kawakatsu (op. cit.) pointed out that “ If Terajima had not, himself, known of the Japanese Bipalium species, he might not have written this last statement. ” The compiler (Sasaki) accepts their viewpoints. Left: “Doko” (=Bipalium? sp.) found in the type-printed book (1885) of Wakan Sansai-Zue. 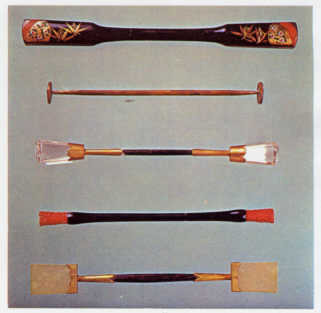 The righ-side photo shows 5 kinds of “kôgai” (cited from the Gendai Grand Hyakka-jiten, vol.8, 1971. Gakushû- kenkyûsha, Tôkyô.). The “how to use” of a “kôgai” can be seen in an additional figure. The genus Bipalium was defined by Stimpson (1857) with 4 new species descriptions from Japan (3 of them are species inquirendae); he also mentioned Chinese Bipalium species (including species inquirendae) in 1861 (a, b). The etymology of Bipalium is “a double mattock or pick-ax” (latin: bi = two; palus, pali (pl.). Namely, the generic name was given based on head shape of animals. Cf. Ogren and Kawakatsu (1987: 79). The land planarian section (especially the Bipaliidae) of Stimpson's 1857 paper and two additional short articles (1861 a, b), reproduced from Dr. Kawakatsu's collection of literature, are printed in a paper by Kawakatsu, Ogren and Froehlich (2000: 99-103). Kawakatsu, M., Ogren, R. E. & Froehlich, E. M., 2000. Additions and corrections of the previous land planarian indices of the world, etc. Bull. Fuji Women's College, (38), Ser. II: 83-103. Ogren, R. E. & Kawakatsu, M., 1987. Index to the species of the genus Bipalium, etc. Bull. Fuji Women's College, (25), Ser. II: 79-119. Stimpson, W., 1857. Prodromus decriptionis animalium evertebratorum quae in Expeditione ad Oceanum, Pacificum Septentrionalem a Republica Federata missa, Johanne Rodogers Duce, observavit et descripsit. Proc. Acad. Nat. Sci. Philad., 9: 19-31. --------, 1861a. On the genus Bipaliura. Amer. Jour. Sci., Art. 2, Ser. 31: 134-135. --------, 1861b. On the genus Bipalium. Ann. Mag. Nat. Hist., Ser. 3, 8: 231-232. Kinmô Zui (wood-block book) was published in 1666 by Tekisai Nakamura (1629-1702), a Confucianist living in Kyôto, Central Japan. The Japanese name of the book means ‘An Illustrated Encyclopedia for the Peoples’ (22 vols., 14 copies). This book contains 1482 articles, of which 686 are related to plants and animals. The second version of this book was published in 1668. 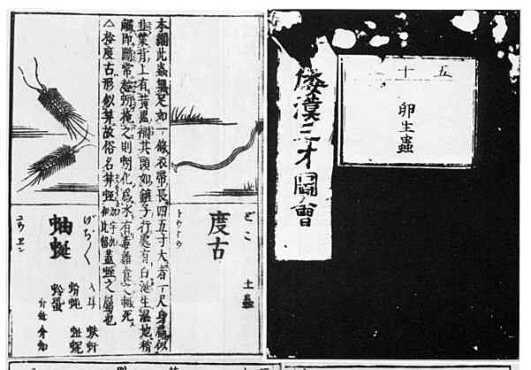 Right: The article of “Doko” in Kinmô Zui (1666). Dr. Kawakatsu's copy reproduced here was taken from the original book of the late Mr. Matsui's collection. Photographic reproduction of the cover page of the original book and pages including planarians is found in Kawakatsu (1969: 39, pl. II) and Kawakatsu, Tamura and Lue (1984: 17). Notice the similarity of figures “Doko” found in Japanese Materia Medicas: Kinmô Zui (1666) and Wakan Sansai-Zue (1713, 1885). Kashiragaki Zôho Kinmô Zui Taisei (wood-block book) was published in 1789 in Kyôto. The name of the compiler is not known; an illustrator was Shimokawabe, S. The Japanese name of the book means ‘A New Compilation of an Illustrated Encyclopedia for the Peoples with Head Notes’ (27 vols., 7 copies). This is undoubtedly a copy of a different edition of the ‘Kinmô Zui’ (1666). However, the style and contents in this new book, published after some 120 years later of the publication of the first edition by Nakamura (1666), are quite different from those of the original book. It is noticed that pronunciation of Chinese characters used in the text and headnotes are shown by letters of an anomalous Japanese cursive syllabary. In the Edo Era, these were favorite letters used mainly by women belonging to the middle and high classes. Thus, we can suppose the classes of readers of the book. Left: “Kashiragaki Zôho Kinmô Zui Taisei”. 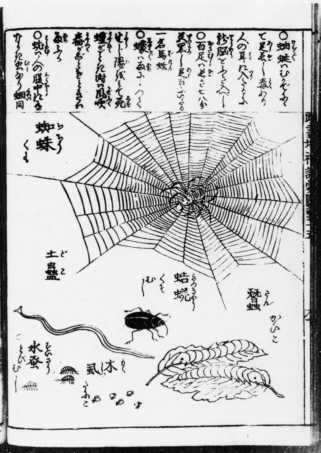 Notice the worms illustrated on a page: a spider and its web (middle); larvae of the silkworm and mulberry leaves (bottom-right); a dung beetle (bottom-middle); a land planarian (=Doko, i.e., Bipaliidae sp. ), a jumping plant lice or an aphis (ord. Hemiptera, fam. Psyllidae) and a spring-tail (ord. Collembola)(bottom-left). 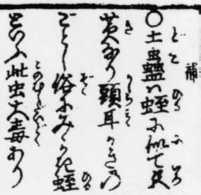 The enlarged headnote of explanation of “Doko” is also shown in the bottom right. Dr. Kawakatsu's copy reproduced here was taken from an original book of the late Mr. Matsui's collection. A photo of the cover page of this book is shown in Kawakatsu (1969) and Kawakatsu, Tamura and Lue (1984). Many kinds of wood-block books of Materia Medica have been published in the Edo Era (1603-1867) in Japan. The 4 principal books with short explanations are given below. 1) Kôsei Honzô-Kômoku published in 1672 (39 vols.). This is a reproduction of Li's (1590-1596) P'en-Ts'ao Kang-Mu printed by the new wood-blocks carved in Japan. The book was compiled by Ekiken Kaibara (1630-1714), who was a naturalist of the warrior class mainly living in Chikuzen (= Fukuoka Pref.) in northern Kyûshû. 2) Yamato-Honzô published in 1709 (16 vols.) by E. Kaibara. The Japanese title means “Japanese Materia Medica”. The book contains 1362 articles. It was written by a mixed style of Chinese characters and many letters of the Japanese syllabary. This means the book could be read by the educated common people at that age. 3) Honzô-Kômoku Keimô published from 1803 to 1866 (48 vols.) This is the final transcript of lectures by Ranzan Ono (1724-1810) at the “Igaku-kan” of Edo (i.e., the Feudal Medical School in Tôkyô). The Japanese title means “New Comparative Studies of Chinese and Japanese Materia Medicas”. This book is known as a monumental publication of the study of Materia Medica in Japan. Its nature is more bibliographic than the other Materia Medicas except for articles on herbal materials. 4) Jûtei Honzô-Kômoku Keimô published in 1847 (48 vols.). The word “Jûtei” in the title means “Revised and Amplified Edition”. This is also the 4th Revised Edition of Ono's (1803-1806) book. Photos of the title and text pages of some of these Materia Medicas mentioned above will be found in Kawakatsu (1969) and Kawakatsu, Tamura and Lue (1984). Notes on “Doko” in the Materia Medica mentioned above are few in numbers and without figures. This information is nearly the same as Li's (1590-1596) Chinese and early Japanese Materia Medicas. The following paragraph translated from Jûtei Honzô-Kômoku Keimô (1847), provides new descriptions of bipaliid flatworm species as well as local Japanese names used at the time. English translation. “ The worm has a body shape similar to that of ‘Uma-biru’ (a horse leech? ); its head resembles the shape of a Chinese character of ‘tei’ or ‘chô’ (i.e., nearly the same shape with ‘T’ in Roman letter)”. Local names: Kattai-biru (i.e., snail leech? ); Ama-biru (i.e., a rain leech); Kaminari-hiru (i.e., a thunder leech) ”. These local Japanese names may have originated from the ecological behavior of bipaliid species. In the later part of the Edo Era there were many naturalists from the ruling class. They made interesting observational notes on various plants and animals (mss. and wood-block books). Several illustrations of bipaliid species from Japan are found here in Materia Medicas of the 19th Century. 1) Keimô Chûfu-Zusetsu (ms., 1838) by Toshiyasu Maeda (1800-1859). He was the 10th Lord of Ettchû (i.e., Toyama Pref.). The Japanese title means “An Educative Sketchbook of Insects and Worms”. His sketch figure of an unmamed bipaliid species (Bipalium? sp.) is shown here. Eight letters of the longitudinal line: “Doko” “Kougaihiru”. 2) Senchû-Fu (ms., 2 vols., 1811) by Tanshû Kurimoto (1756-1834). He was a famous naturalist of his time and a herb doctor of highest rank. He left many illustrated zoology sketchbooks (mss.). In 1826, he met with Philipp Franz von Siebold (1796-1866) who visited Edo from Nagasaki. His sketch figures of 2 live specimens of an unknown Bipalium? sp. with well-developed head auricles are shown here. Dr. Kawakatsu's copies reproduced here were received from Dr. J. Hasegawa. 3) Chûchi Zufu (ms., bottom-left). The name of the painter and the painting year are unknown (probably the late age of the Edo Era in the 19C.). 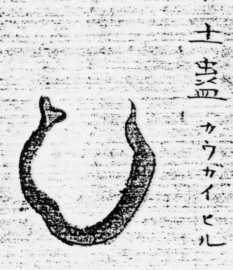 The Japanese title means “An Illustrated Sketchbook of Various Worms with and without Legs”. Water-color paintings of 3 living specimens of an unknown Bipalium? sp. (spp.?) with well-developed head auricles are realistic. In the figure on the left, we give the following English translation of the 9 letters of longitudinal script on the right side. “ Bipaliid species; loc. Mito ”. Mito City, Ibaraki Pref., is located approximately 100 km NE of Tôkyô. The 5 letters of script on the left-side mean: “ A pale pinkish specimen ”. Dr. Kawakatsu's copy reproduced here was taken from the original copy of the late Mr. Matsui's collection. 4) Hôbun-Chûfu (ms., ca. 1800) by Hôbun Mizutani (1779-1833). He was a herb doctor of Owari (i.e., Nagoya in Aichi Pref.) in Central Japan. The Japanese title means “A Sketchbook of Worms”. His sketches of 2 specimens of land planarian are of poor quality. Dr. Kawakatsu's copy reproduced here was received from Dr. J. Hasegawa. Additionally, Hôbun Mizutani was the Chief of the ‘Materia Medica Study Group’ of Nagoya. He met with P. F. von Siebold in 1826 in Nagoya. Note. The family Bipaliidae has the following 3 genera. Numbers of species in each genus and their geographical distribution ranges are also shown. Dr. Kawakatsu and Dr. Ogren have the following opinion about the taxonomic rearrangement of the family Bipaliidae (in litt.). “Today it is desirable to restrict the use of genus Bipalium to strict definition based on the anatomy and histology of copulatory organs. It is suggest that we should use the new collective group name (cf. ICZN, 4th Ed., 1999: Art. 42.2.1.). It would be defined in a general way to include species having external features of the Bipaliidae, lacking knowledge of sexual organs, poor descriptions, or species inquirendae. This suggestion would require a note on each paper, and eventually included in a more technical taxonomic paper”. The formation of the collective group (i.e., a genus) name would require placing “Bipalium multilineatum” into it. Thus, this Japanese species is tentatively cited as Bipalium? multilineatum. As the one responsible for this compilation, Sasaki wishes to express his hearty thanks to Dr. Masaharu Kawakatsu (Sapporo, Japan) for suggesting this study as well as for constant guidance in the course of this bibliographic work. Thanks are also due to Dr. Makoto Mayanagi (Mito, Japan) for some valuable suggestions about Materia Medica. Finally, Sasaki is also indebted to Dr. Robert E. Ogren (Kingston, PA, U.S.A.) for his careful reading of the final English draft and valuable comments on land planarians. Related papers and books written in Japanese (and Chinese) are not cited in this Section. KAWAKATSU, M., 1969. On some old records of turbellarians found in the Japanese books printed in wood-block. Bull. Fuji Women's College, (7), Ser. II: 30-43. KAWAKATSU, M., 1991. History of the study of Turbellaria in Japan. Hydrobiologia, 227: 389-398. KAWAKATSU, M. and LUE, K.-Y. 1984. History of the study of Turbellaria in China. Part 2: Ages of studies by Japanese and Chinese turbellariologists. Bull. Fuji Women's College, (22), Ser. II: 105-117. KAWAKATSU, M., OGREN, R. E. and FROEHLICH, E. M., 1998. The taxonomic revision of several homonyms in the genus Bipalium, family Bipaliidae (Turbellaria, Seriata, Tricladida, Terricola). Bull. Fuji Women's College, (36), Ser. II: 83-93. KAWAKATSU, M., OGREN, R. E. and FROEHLICH, E. M., 2000. Additions and corrections of the previous land planarian indices of the world (Turbellaria, Seriata, Tricladida, Terricola). Additions, etc. - 8 (2). Bull. Fuji Women's College, (38), Ser. II: 83-103. KAWAKATSU, M., OGREN, R. E., FROEHLICH, E. M. and MURAYAMA, H., 2001. On the places of origin of three, very large bipaliid land planarians from Japan (Turbellaria, Seriata, Tricladida, Terricola). Shibukitsubo, (22): 31-44. KAWAKATSU, M., TAMURA, S. and LUE, K.-Y., 1984. Preprint of papers given at the Fourth International Symposium on the Turbellaria. Occ. Publ., Biol. Lab. Fuji Women's College, Sapporo (Hokkaidô), Japan, (12): 1-20. LUE, K.-Y. and KAWAKATSU, M., 1986. History of the study of Turbellaria in China. Part 1: Ages of Materia Medica and of early expeditions by westerners. Hydrobiologia, 132: 317-322. OGREN, R. E. and KAWAKATSU, M., 1987. Index to the species of the genus Bipalium (Turbellaria, Tricladida, Terricola). Bull. Fuji Women's College, (25), Ser. II: 79-119. OGREN, R. E. and KAWAKATSU, M., 1988. Index to the species of the genus Bipalium, etc. : Additions and corrections. Occ. Publ., Biol. Lab. Fuji Women's College, Sapporo (Hokkaidô), Japan, (19): 1-16. OGREN, R. E. and KAWAKATSU, M., 1991. Index to the species of the family Geoplanidae (Turbellaria, Tricladida, Terricola). Part II: Caenoplaninae and Pelmatoplaninae. Bull. Fuji Women's College, (29), Ser. II: 25-102. OGREN, R. E., KAWAKATSU, M. and FROEHLICH, E. M., 1997. Additions and corrections of the previous land planarian indices of the world (Turbellaria, Seriata, Tricladida, Terricola). Addendum IV. Geographic locus index: Bipaliidae; Rhynchodemidae (Rhynchodeminae; Microplaninae); Geoplanidae (Geoplaninae; Caenoplaninae; Pelmatoplaninae). Bull. Fuji Women's College, (35), Ser. II: 63-103. OGREN, R. E., KAWAKATSU, M. and FROEHLICH, E. M., 1998. Additions, etc. Addendum IV, etc. Errata. Occ. Publ., Biol. Lab. Fuji Women's College, Sapporo (Hokkaidô), Japan, (31): 1-4. OGREN, R. E. and SLUYS, R., 1998. Selected characters of the copulatory organs in the land planarian family Bipaliidae and their taxonomic significance (Tricladida; Terricola). Hydrobiologia, 383: 77-82. OGREN, R. E. and SLUYS, R., 2001. The genus Humbertium gen. nov., a new taxon of the land planarian family Bipaliidae (Tricladida: Terricola). Belg. Jour. Zool., 131 (Suppl. ): 201-204. READ, B. E., 1934. Chinese Materia Medica. VII. Dragons and Snakes. Peking. Nat. Hist. Bull., 8 (pt. 4): 297-362 + 5 folders. There are many kinds of manuscripts and wood-block books of natural history, so-called Materia Medica, prepared and published in China after the 6th Century. Various edditions of these were introduced into Japan from China up to the beginning of the 17th Century. Then, during the following 200 or more years, various Japanese versions of Materia Medica were written or printed by early Japanese naturalists. Some triclad species (especially bipaliid land planarians) can be found in these Materia Medica. Kawakatsu and his co-authors have published several papers on this topics: Kawakatsu (1969), Kawakatsu & Lue (1984), Kawakatsu, Tamura & Lue (1984), and Lue & Kawakatsu (1986). The latest publication on this topics is a paper by Kawakatsu, Ogren, Froehlich & Murayama (2001). In this paper, we considered that the oldest authentic record of a Chinese bipaliid species was found in Ch'eng-Shih T'uan's ms., entitled "Yu-Yang Tsa-Tu" (produced in the middle of the 9th Century). We also considered that old Chinese records may include two bipaliid species, i.e., Bipalium nobile Kawakatsu et Makino, 1982, and Bipalium kewense (Moseley, 1878). The natural range of B. nobile is considered to be mid-central China; the species may have been introduced into Japan (probably the vicinity of Tôkyô) after World War II. The natural range of B. kewense extends from Vietnum to Kampuchea possibly extending to Malaysia. In the continental Far East, its dispersal may have been gradually expanded. It is suggested that this species was introduced into Japan after the World War II. In January, 2001, I got a new friend, Mr. G. Sasaki, who is familiar with computer work. After he referred to resources for Materia Medica on the web, new bibliographic data were obtained. Namely, at present, the first record of a Chinese bipaliid species was found in Tsang-Ch'i Ch'en's ms. produced in C.E. 739 in China: P'en-Ts'ao She-I. This report of a bipaliid planarian is 130 years older than that of Tu'an's Yu-Yang Tsa-Tu. The contents of both mss. are nearly the same. The early draft of this web article prepared by Mr. Sasaki (Japanese version) was read by myself with the greatest care. March 10, 2001. For the preparation of the English version, I gave him a practical support. May 18, 2001.